Sean Reidy was second in the 400m hurdles. 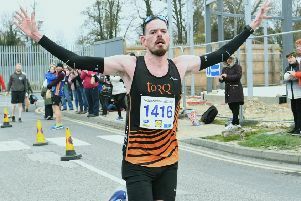 Nene Valley Harriers suffered British League relegation on Saturday. After just one season competing in the second tier of British men’s athletics, the city club will find themselves back omn Division Three next summer. Harriers needed to finish three places above Bristol in Saturday’s final match at Kingston to stand a chance of escaping the drop and they certainly gave them a run for their money. There were only three points between them at the end of the day but Bristol secured fifth spot and Harriers had to settle for seventh. And that was where they finished in the overall standings and they’ll drop down with Gateshead. Harriers fielded arguably one of their strongest teams of the season for the last match - but then so did other clubs threatened by relegation. And it meant Harriers managed to record only one win all afternoon. That came from Dave Connell in the 3000m steeplechase B race in 10:25:3. Joe Turner also did well in the A race, clocking another personal best (PB) of 9:54:2 for second. There was also a second place on the track for Sean Reidy in the 400m hurdles B race while in the field events Martin Tinkler was runner-up in the A string shot with 14.79m. Match result: 1 Thames Valley 363pts; 2 Harrow 343pts; 3 Kingston 329pts; 4 Crawley 270pts; 5 Bristol 250pts; 6 Notts 248pts; 7 Nene Valley Harriers 247pts; 8 Gateshead 69pts. 100m - A 6 Darrellon Holding 11.16; B 6 J. Berney 11.60. 200m - A 7 J. Berney 23.88; B 6 J. Thomas 23.75. 400m - A 3 Darrellon Holding 49.9; B 7 Ollie Dilloway 51.8. 800m - A 5 J. McCrae 1.56.06; B 6 M. Butler 2.01.7. 1500m - A 7 A. Hampson 4.10.55; B 7 J. McCrae 4.24.56. 5000m - A 7 A. Johnson 8.59.80; B 8 M. Butler 11.11.29. 110m hurdles - A 4 M. Everest 15.64; B 3 S. Reidy 16.18. 400m hurdles - A 6 B. Jones 54.74; B 2 S. Reidy 55.2. 3000m steeplechase - A 2 J. Turner 9.54.2 (PB); B 1 D. Connell 10.25.3. High Jump - A 4 A. Barker 1.88; B 5 S. Reidy 1.63. Pole Vault - A 6 P. Lewis 3.43. Long Jump - A 3 S. Richards 6.82; B 6 B. Jones 5.78. Triple Jump - A 4 A. Ingham 12.83; B 4 S. Richards 11.78. Shot - A 2 M. Tinkler 14.79; B 3 S. Achurch 11.53. Discus - A 3 M. Tinkler 41.39; B 4 S. Achurch 32.90. Hammer - A 7 I. Huskisson 39.00; B 5 S. AChurch 34.19. Javelin - A 3 A. Ingham 51.48; B 4 D. Bush 41.59.